It has been gray for weeks. I don’t remember the last clear day. The last few days, even small IFR traffic stays on the ground as the low hanging clouds are full of ice. In this weather, it is best to leave the flying to the pros with the heavy iron. For folks like me, this is the time of year for theory (or a flying vacation – but for now, that will remain a future blog post to dream of…). I’m back at the local aviation administration. The testing office has become home turf over the course of the last few visits. The examiner greets me by name. I’m here for the theory exam for Controlled Visual Flight (CVFR). This module is the last step I need to upgrade my national private pilots license to the international one. I feel well prepared. I used the same tutoring software that has led me through the previous theory exams. The subjects tested today are “Navigation”, “Air Law” and “Aircraft Performance”. The test starts, I read the first question and I have never heard it before. Odd, the tutoring software was spot on in all previous test. The surprises continue. The questions are within the field I have learned but many of them are not from the database I have used. Judging by his face, the guy next to me has the same problem. It is the nicest day in weeks. The clouds are orange with the morning sun against a blue sky. The instructor is very upbeat when I arrive at the flight school. 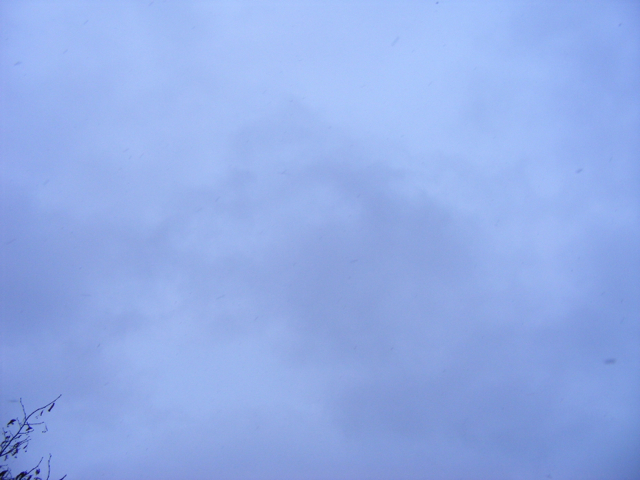 The gray weather of the last couple of weeks demoralized not only his students. Last night, I talked to the examiner on the phone. He gave me the route for today so that I can prepare the flight. I get busy on the flight planning sheet, fill in this mornings weather. It takes me a long time to complete the calculations. I am nervous. The examiner arrives and is very relaxed. He is new and my instructor pays a lot of attention to the questions he asks and the things he checks. With a cup of coffee, we go through the papers. After I answered all of his questions about the registration and the radio certificate, he wants to go fly. I’m after a mouth full of letters: PPL-A JAR-FCL. That is the “Private Pilots License for airplanes” (PPL-A) after Part “Flight Crew Licensing” (FCL) of the “Joined Aviation Requirements” (JAR) of the “Joined Aviation Authorities” (JAA) of Europe. One of the joined requirements is the rating for “Controlled Visual Flight Rule” (CVFR). I am scheduled for the check ride this morning. This is my fourth check-ride. I start with a very thorough pre-flight check and talk about everything I do. The examiner has a lot of questions but I am prepared. Last time I did not know the alternator from the starter – this is not going to happen to me again! Our route will take us into the controlled airspace of the big city today. We plan a low approach at the international airport before we leave to the south for navigation drills and air work. All in all the small triangle should not take us more than an hour. The home base is very close to the class D airspace of the big city. So I need to check in with Air Traffic Control (ATC) quickly after take-off. Before I call the controller, the examiner tells me that I can announce that this is a check ride if I like. Some examiners will not let you do that as the controller might then treat you differently. The frequency is not very busy. After I have announced our intentions, we are cleared for the controlled airspace right away. The examiner picks up the mike and talks to the controller again “we would like to do a low pass” he says. My mind is on high alert. Did I not just announce that to the controller? I thought I did. In fact I am almost certain that I did! The controller comes back after a perceivable pause “yes,…that is how I understood your intentions” she says. I am relieved! The flight through the class D airspace is uneventful. I announce the compulsory reporting points and the controller acknowledges it. Except for these exchanges, there is no traffic on the VFR frequency. I have time to relax and to enjoy the flight. The timing for our low pass is good. We are cleared for the approach and I turn from base to final. The perspective on the massive runway with its landing lights in front of us, is quite spectacular. Trying to keep the time we block the approach sector as short as possible, I do not set flaps and fly in fast. A few feet above the ground, I round out, close the carburetor heat and push the throttle forward. The large Lycoming in front of us rumbles to life and pulls us out of the Airbus territory. The first part of the check ride is over. I have come to like VORs very much. These “light houses” of aviation are a bit anachronistic but very reliable. We determine the course to the VOR on our route, then I determine the wind influence and follow the examiners instruction to approach the VOR on a different course. He asks and I answer. Only once he succeeds in confusing me a bit, but I manage to regroup. We are on course back to the home base. The last items on the protocol are steep turns. A full circle at 45 degree bank with holding altitude and speed is a difficult thing to do and I need three attempts before the right seat is happy. The landing is the best I have done in weeks. Perfect approach and a smooth landing, my instructor will be proud. After the engine is shut down, the instructor smiles. I have passed! Thunk. The main wheels make contact with the runway at 70 miles per hour. The rubber squeaks a bit but that is normal. I hold the nose up for a bit longer until the aircraft has slowed down so much that the lift disappears and the nose wheel gently settles down. We have transitioned from flight to taxi. Learning how to land is probably the biggest challenge in learning to fly. The aircraft is designed to fly. It wants to fly. So taking off is relatively easy (throttle forward and off she goes). A good landing requires a smooth transition from flying to not flying and that can only be done with a lot of practice! My first solo was after about 100 landings with the instructor. Now, after flying for about two years in five or six different aircraft types, I maintain a health respect for the process of landing. And every pilot will have the occasional bad landing, even after years of experience. It all starts in the pattern. The traffic pattern is a set routing for the approach to any given airport. It enables the pilot to execute the phases of the approach and finally land the aircarft even if he has not been to one particular airport before. Enter the pattern in the downwind leg. Slow down and start setting flaps. Turn on carburetor heat, double-check traffic situation and turn into base (90 degrees off the landing direction). Double-check the location of the runway, check wind, possibly check landing lights. Start loosing altitude, typically about 200 feet. Now you are ready for the final approach. Turn one more 90 degree turn into final. The runway is in front of you now. Make sure not to loose too much speed and/or altitude during the turn. Check and adjust the glide path, align the aircraft with the center line of the runway. As the wind is almost never coming from straight ahead, I usually drift away from the center line. There are two possible ways to compensate for that. 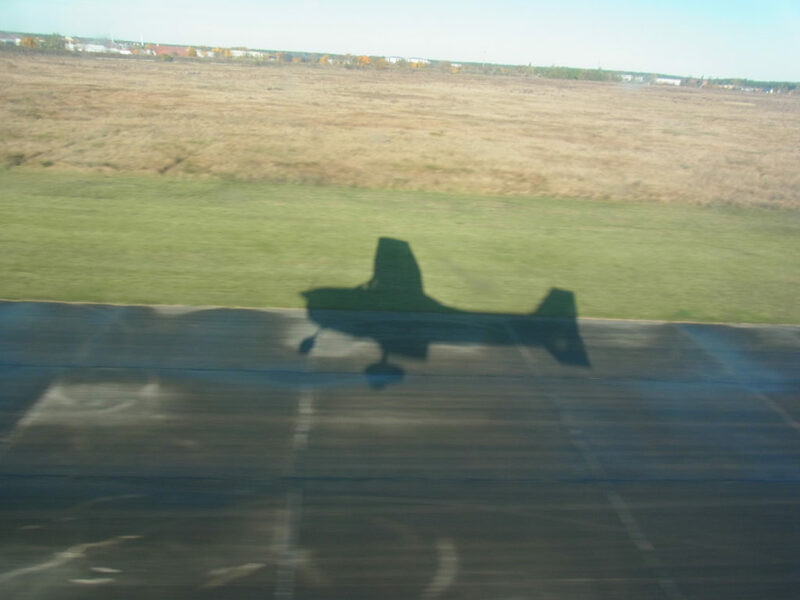 I can turn the nose into the wind and approach the runway at an angle. In this scenario I have to straighten the aircraft out shortly before I touch down. If I don’t do that, the landing gear gets pushed down the runway sideways and may break. The crabbed approach is how the big airliners do it. My flight school prefers to teach the other method, however. In this I use the ailerons to lower the wing into the wind. So if the wind comes from the right, I lower the right wing tip. If I would only do that, the aircraft would start a right turn. To counter act that, I push the left rudder pedal which forces the nose to the left and counter acts the movement to the right. Now I have to hold the balance of these counter acting steering impulses. As drag increases from the crossing of the rudders, I have to make sure we don’t get too slow. For this I keep the nose down a bit. Also I have to make sure we get to the touch down zone of the runway and I have to adjust the power setting of the engine accordingly. Sounds complicated? It is! So why do I learn this complicated method as opposed to the straight forward angle of attack? Well, the significant advantage is that I am already aligned with the runway in the very last moment of the approach when I flare the aircraft out. I can concentrate on slowly reducing the energy of the movement of the plane before it touches down hopefully very softly. The aircraft can easily touch down on one wheel first and the settle down on the other one as the lift reduces and the aircraft “gets heavier”. How high is a beer bottle? If I would hold the attitude of the aircraft until it makes contact with the runway, the nose wheel would probably be the first thing to touch down. It would probably collapse and the prop would strike the tarmac. A very expensive landing. That is why I pull the nose of the aircraft up shortly before the landing. Now the aircraft is supposed to float down the runway with this nose-up attitude. The engine is in idle and the attitude means a lot of resistance. So the aircraft is supposed to slow down, the lift decreases and eventually the main wheels make contact with the runway, cat like. I bought a text book in order to prepare for the CVFR rating. I have always loved good text books. I know, that’s a bit weird, but I like to follow a well organized stream of thoughts on a specific topic. CVFR is a very specific topic. Controlled Visual Flight Rule is a part of the qualifications of a private pilot. The rating will enable me to fly in controlled airspace and with guidance by ATC. The big thing about CVFR however, is learning to make better use of the instruments and to use radio navigation. VOR stations are the back bone of radio navigation. VOR is short for “VHF omnidirectional radio range”. The idea is very close to the idea of a light house. The VOR indicator in the cockpit shows me the bearing to the VOR station. The VOR stations are marked on my aviation map. If I know That my relative bearing to the station is 090, I know that it is at 90° to the right. So I know that if I draw a line at 90° from the staion, my position would be somewhere on this line (called a radial, by the way). This information alone is enough to get a pretty good idea about my position if combined with other VFR navigation skills (“this looks like the lake on the map”). At night or above the clouds however, I would need a second VOR station in order to do a triangulation. If I know that I am on radial 90° of station A and radial 200° of station B, I can draw two lines on my map and the point at which they meet is going to be my position. I have been taught to use the VOR from my first lesson for the private pilot on. My instructor knew that I was going to go for the CVFR rating eventually. Today he means it. The flight preparation today is longer than usual. We have a very detailed flight plan. Up to the north and climbing up into the controlled air space over the city. Then a flight from the VOR in Löwenberg, via Tegel Airport to the VOR in Fürstenwalte. North to south over the big city. I call ATC after take-off and anounce our big plan. After a bit they call back with bad news. The weather is bad, the airspace is full and they don’t need a green horn who needs extra attention. No clearance for me today. Plan B is to clear the controlled airspace to the north and then climb to 7.500 feet and do our drills there. The day is rainy and other small aircraft ask for advice and divert right and left. My instructor is not impressed by a bit of rain on the screen and before long we are above the grey clouds. I close the vent as the stream of outside air is getting quite cold. The instructor hands me the IFR cap “Put this on”. An IFR cap is a plastic visor that blocks the view to the outside. After I put it on, I can only see the instruments. What a difference! The first task at hand is to hold course and altitude. The air up here is calm but I still need a lot of concentration for the task. After a bit, the instructor tells me to start going right and left, 10 degrees from the course. After this works, he pulls the flaps lever. Kilo Sierra slows down because of the added drag and climbs at the same time because of the increase in lift. I counter the movement and fight to keep the altitude. The instructor seems to believe that I will not fall out of the sky. So we start with navigation. He tells me to fly to the Fürstenwalde VOR station. We had set the frequency before, so all I have to do now is turn the bearing indicator of the VOR receiver until the course deviation indicator is in the middle and the direction flag shows “To”. The bearing to the station is 179, so I turn right onto the new course. After a few minutes, the instructor tells me to sink. We go down to 5.500 feet, 3.500 feet, then 2.000 feet. Finally I contact Strausberg and ask for QDM. That is the magnetic heading to the station. The controller on the tower can determine my relative bearing to him. The heading to the airport is 250. So I turn right until I have 250 locked and ask again. 260 now. The runway is 270, so we are getting very close. The instructor tells me to sink to 1.000 feet and take off the cap. The runway is directly in front of me, I am on long final – wow! After we are back on the ground and done with the de-briefing, I walk to the train station. There is a light drizzle and I enjoy the rain on my face. My head is pounding from the concentration, I’m exhausted but I feel great nontheless. A check ride is a test of the pilots nerves. Your instructor will not sign you up before he is sure that you are ready. The examiner is not interested in failing you either. So the only thing you realy have to worry about, are your own nerves. I have had several check-rides. The first one, for my sports pilots license, was the worst. In the beginning, my hands were shaking from nervousness. In the end I passed and found out, that the examiner was both understanding and doing his best to help me calm down. Today I have my next check ride. I will try to get the class rating for single engine piston aircraft with up to 2 tons of maximum take-off weight. The day starts with coffee and sandwiches in the flight school. The office manager tells me later on that she always gets sandwiches on the day of a check ride. She found that a snack gives the examiner a good mood and helps the student relax. She is great! Kilo Sierra is waiting for us on the apron. We start with a thorough pre-flight check. I keep talking and comment the checks I perform. I learned early on that this is important. The examiner follows me around the aircraft and asks many questions. More than I expected. And then he gets me. He points at the air intake behind the propeller. A small device, driven by a belt is mounted there. “So, what does this do?” he asks. My instructor is very much a pilot and not so much a technician. We never took the cowling off, I have never examined the engine except for the parts visible through the oil filler door. “Alternator, generator, starter…?” I try to guess. The examiner smiles, “yes, one of the above”. After he tells me that we are looking at the alternator, he wants to see me fly. We take-off and go towards Neuhardenberg. On the way over there we do full circles in various degrees of bank as well as some stall drills and slow flight. Nobody answers my calls in Neuhardenberg (as expected) and so we use the runway for a low pass and go-arround maneuver. We climb out and go over to Eggersdorf for the more demanding part of the check ride. Various start- and landing drills. 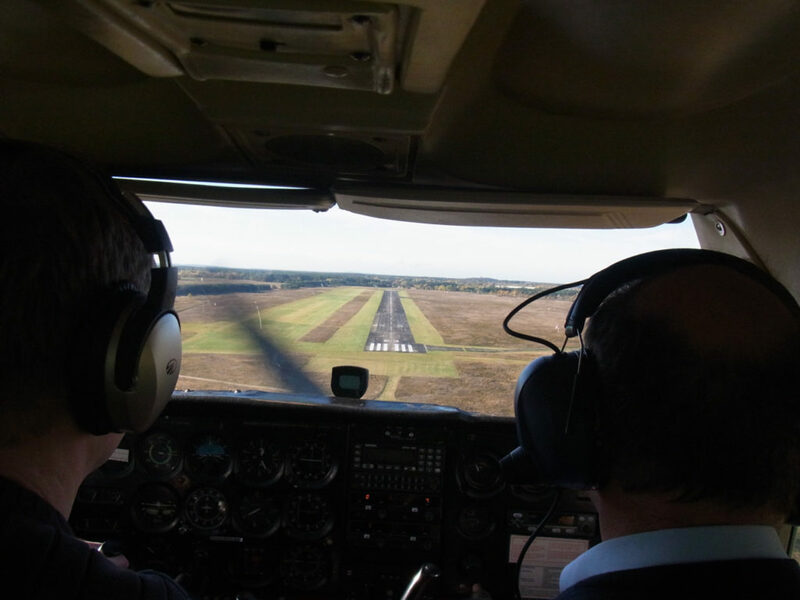 We perform a short field landing and take-off, a landing without engine power and a landing without flaps. Finally we simulate an engine failure shortly after take-off. In this maneuver, everything has to be very fast (nose down, flaps out, watch your speed, flare, land). We have trained this many times and I know the drill. The examiners check list is complete and we go back to Strausberg (track of the route, Google Earth plug-in required). I land and while we taxi back to the apron, he asks me for the times of the landings in Eggersdorf. He’s got me again, I did not write them down. Stupid mistake! I tell him that I will have to call the tower in Eggersdorf and ask for the times. “They will role their eyes at you” he says and tells me that he has got them. I’m unhappy about the stupid mistakes. The examiner is cool about it. He smiles and congratulates me. The rest must have been enough for the rating. Yesterday I had my first five solo rounds in “Kilo Sierra”, the four seat Cessna 172 I’ve been training on lately. This was the third time I had a “first solo” in a new aircraft. A very special moment every time. But also a situation that I can face with more confidence now, compared to the “first first solo“. The day was sunny and very calm, perfect conditions. Next stop: Check ride for the 2 ton rating! The big city has two international airports and a no-fly zone in between them. So everything west of my home airport is controlled airspace. I have been flying around it for two years but never ventured into it. Until today. The sky looks dark towards the west and I can see rain showers. We hit the rain shortly after take-off on climb. Kilo Sierra is shaking but the shower is very local and we can go around most of it. We check in with the controller an I announce our intention: “VFR from Strausberg to Schönhagen, via Echo and Bravo, low pass over the runway of SXF (the larger one of the two international airports), exit via Sierra to Schönhagen”. The controller informs us that he has rain and wind gusting up to 39 knots. My instructor is not worried. “It always looks worse from the ground”. The controller is cool with us trying as far as we can make it. In the control zone I have to stick to a set route from one compulsory reporting point to the next. The first one is Echo 2 at the intersection of a train line and a highway. I announce our position, the controller acknowledges it and we are in. Easy as pie. We fly over the suburbs, over the outskirts and then over the city. Before we reach the no-fly zone over the city center, we turn left towards the airport. The rain has moved to the east and the sun glitters on the wet roofs of the buildings. Between Echo 1 and Bravo, I can see my house. I’m loving it! SXF is being expanded and transformed into the cities new international airport. The terminal building, the new control tower and the new runways are directly in front of me now. I see the traffic on the ground (very cool) and a number of approach lights coming out of the dark clouds to the left (a bit frightening). I ask the controller for clearance for a low pass over the runway but there is no chance. The weather has delayed the afternoon rush hour and there are a bunch of large jets waiting to get in. In between two of them, we manage to cross over the airport at pattern altitude and make our way over to the next reporting point Sierra. From Sierra, it is not far to Schönhagen, south west of the big city. It is a very popular airport for the general aviation community. We land and taxi by a number of different aircraft on our way to the tower. After a few minutes and a nice chat with the clerk at the desk, we take-off again. We fly north and re-enter the control zone via the Whiskey route. Whiskey 2, Whiskey 1, Bravo and another attempt for a low over pass. This time the traffic situation is more relaxed. We see two easyjet Airbus A319s lining up for take-off on runway 25 right. The first takes-off and by the time we are cleared for the downwind of the pattern, the second one is on the runway already. We are trying to do this as quickly as possible. So we are not slowing down much on base and are not setting flaps. I turn into final approach and there it is: Runway 25 right, 2710 meters by 45 meters of illuminated concrete. Wow. We are coming in fast (for a little Cessna) and I’m still caught-up in the moment when we see another Airbus waiting at the holding point. So we stop dawdling, I push the throttle to the fire wall and we are out of there as quickly as we came. Getting so close to heavy metal was much less frightening than I thought! PS: See the entire flight here (you will need a google earth plug-in). The tracking is provided by CloudAhoy.com, a great service that lets you track flights using an iPhone and analyze it online – free of charge. Weekends at the airport are usually busy. Today it is warm but rainy. A front with rain showers and low clouds is slowly moving over the city. Many pilots stayed at home. When I arrive at the flight school, a charter customer and his friends are drinking coffee. They got caught in a rain shower and decided not to continue their pleasure flight. My instructor sees the weather as a learning experience. So we go. On the way over to EDON (Neuhardenberg), we get caught by the rain. He tells me to do a full circle “use the instruments and try not to loose altitude”. 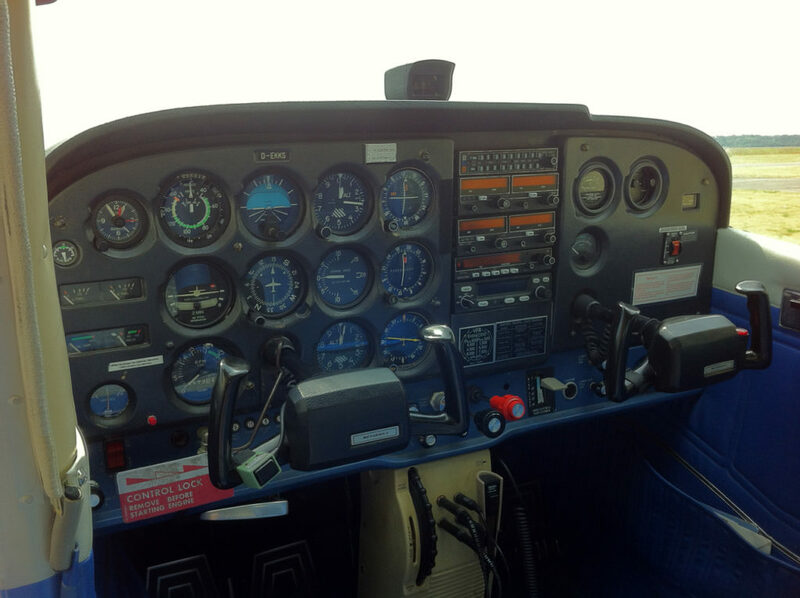 I concentrate on the artificial horizon, the change indicator and the directional gyro. The sound of the rain hitting the metal roof of the cabin resonates with the engines sound. What are you doing, out there in the rain?! Neuhardenberg does not answer our call for a long time. Finally a confused voice comes on. “We are closed today. But what are you guys doing here in the rain, anyway?”. So we “divert” to EDCE (Eggersdorf). Not the first choice on a day like this as they have a grass strip which is not too comfortable when wet. We are following the FWE VOR (Fürstenwalde) which should bring us right by Eggersdorf. I concentrate on staying below the clouds. Eggersdorf is not far and I look for the airfield ahead and to the right. When I spot it, we are almost past it already. We are still at 2.000 feet and I will not be able to get down to pattern altitude in the remaining distance. We are alone in the pattern and go through our program. Short landing, short take-off, simulated engine failure after take-off, landing without flaps. During our last round, the rain shower reaches Eggersdorf. The controller suggests the airport restaurant to wait for the rain to pass. “We would miss all the fun!”, the instructor answers. So I fly into the rain with very little visibility. “Check airspeed, direction and make sure you climb” says the instructor. That is what Captain Dave always pays attention to. For me it’s the first time that I need to check the instruments to make sure I have a positive rate of climb!